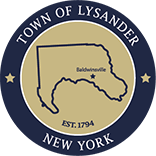 The Assessor’s Office is responsible for placing an equitable value on each parcel of land in Lysander. This is achieved each year through annual reassessment as prescribed by the NYS Office of Real Property Services. The Assessor is available by appointment throughout the year to discuss assessments. Grievance Day is the First Tuesday in June. Notification is published in the official Town newspaper, The Messenger, on or about May 1. Informal hearings to discuss assessments are held during March & April, call 638-0839 to schedule an appointment. Six copies of RP-524 (located in the Assessor’s office or below) must be submitted to receive an appointment for Grievance Day. What is the most recent selling price of a house? This information may be found on Onondaga County’s website (www.ongov.net) and the Sunday edition of the Syracuse Post Standard. Annual reassessment is a systematic annual review of assessments in the Town. A systematic review of each parcel does not mean that every assessment will change every year. RP-458-b 2 pages Cold War Veteran’s Exemption. RP-460 2 pages (8/06) Application for Partial Tax Exemption for Real Property of Members of Clergy.